The episode starts with Oliver and Diggle failing yet again to stop Damien, who in typical Disney villain fashion, explains what he’s doing and then leaves the heroes alive. Sigh. Oh happiness, Curtis shows up! Did you hear the news that Echo Kellum was upgraded to full cast member next season? Yay! But in the meantime, Curtis teams up with Felicity and her dad to stop Rubicon. The Tech Dream Team is together! Damien needs a hacker too, so he picks up Felicity’s old college boyfriend, Cooper. But all's not well in Felicity’s world. The Smoak family drama is actually fairly well-written. It helps flesh out Felicity’s character, as we kind of see two sides of her personality fighting in the form of her parents. It was nice to see Felicity’s character grow in a context beyond Oliver. Although Curtis had to ruin it by drawing a parallel between Donna and Noah's issues and Ollicity. Sigh. Oliver and Diggle track Thea down to Damien’s Ark, and what follows is a pretty neat firefight with Team Arrow running over perfectly-manicured lawns while shooting down Ghosts. 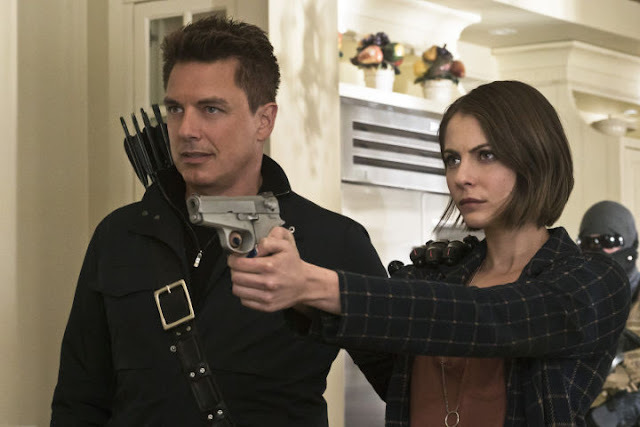 They find Thea, but she’s been drugged by Malcolm, because Merlyn is literally the worst. Ollie and Diggle manage to hide out in the home of some creepy Ark family. The patriarch explains that he didn’t need to be drugged; they came down willingly because Star City is a cesspool, so clearly the answer is to blow up the world. I mean, can’t you just move out of Star City and go somewhere more pleasant? I hear National City is pretty nice. There is something to be said about this strange moment (and this entire plotline) being analogous to white flight, but I don’t think I have the room to discuss that here. What bugs me about this scene is that despite the obvious trash this white dude is spewing, somehow Oliver is moved to say, “maybe he’s right. I haven’t been a symbol of hope.” Or, you know, maybe the guy is freaking nuts? Anyway, Thea shakes off the drugs, and there’s a brief fight with Merlyn. But Anarky is still on the loose, and Oliver and Diggle decide to go find him. They make Merlyn evacuate the Ark because it’s probably going to blow, right before the world blows. Team Arrow fails to save Ruvé Darhk, but they do manage to save Damien’s daughter. Maybe that will buy some goodwill later? Apparently batshit with grief, Damien shows up at Felicity’s apartment. This almost certainly means trouble. And we pick up immediately where we left off, with Damien threatening Donna Smoak. Team Arrow shows up with Darhk’s daughter in tow, and they trade Donna’s life for the child’s. Curtis did get knocked out in the fight and hurt badly. In the heat of the fight, HIVE took Felicity’s laptop that had the Rubicon hack on it. Oops. So apparently Rubicon is still a thing, even though the Ark’s been destroyed. Turns out that Damien is so mad about Anarky killing his wife, that he’s going to destroy the world anyway. This might be the picture-perfect definition of overkill, Damien. 15, 434 missiles? Yikes! But we have something more important to worry about, because there’s a missile landing on Star City in 45 minutes! Chop chop, Team Arrow! Felicity finds a way through Cooper’s Rubicon firewall, but at that moment, HIVE shows up to shoot up the Arrowcave, because anyone can walk into that place at any time. These people need a German Shepard or something. The security is terrible. Anyway, with the Arrowcave destroyed, the situation is dire and Oliver has no hope. Curtis wakes up in time to give Ollie a pep talk about how he can be a symbol of hope. So Oliver bucks up and gives the speech of a lifetime to calm down the citizens that were previously running around in confused riotous circles. On a serious note, this scene is incredibly silly. The extras were terrible at trying to look like a rioting mob. Meanwhile, Felicity and Curtis figure out a way to divert the missile and save the city. Hurray! One down, 15,433 nukes to go! Before heading out to save the world, Diggle admits to Lyla how the Andy death went down. Lyla understands, because she’s a soldier and she knows John did what he had to do. John, however, still thinks of himself as a monster. Oliver shows up at City Hall to fight Damien, and inexplicably, this ends up being taken to the streets. This puzzles me, because I thought we had proven that Damien was capable of crushing Oliver with a thought. Why is Damien willing to engage in fisticuffs 15 minutes before the end of the world? For the final lolz? But of course it’s not that easy. Citizens appear to back up Oliver. Damien gives a speech about how humanity is a cesspool and it needs to be destroyed, and HIVE shows up to engage in hand-to-hand combat with unarmed citizens. Apparently the Ghosts, too, were looking for their last huzzah, because they don’t bother with guns and just run into the fray with fists. Did they run out ammunition? Maybe they should plan for the end of the world a little better next time! Felicity tracks down Cooper and convinces him to be a hero, so he dies horribly, and she magically diverts 15,000 missiles. (Supposedly they go into space, but come on, seriously? SERIOUSLY? This is how the writers choose to end this apocalyptic storyline? The silliness, it burns!). Anyway, the world is saved! Happily, Oliver does what needs doing, and puts an arrow through Damien’s heart. Not so happily, Team Arrow is splitting up. Thea is afraid of becoming her father, so she decides to leave. Quentin Lance, who got fired, drives into the sunset with Donna. And John says he needs time away to get his head straight. So to deal with killing his brother, he rejoins the military, because killing brown people overseas will make things better I guess. So Team Arrow has been reduced to Oliver and Felicity. I never bothered mentioning Lian Yu flashbacks in my reviews on this site, because season four flashbacks were pretty much worthless. The most meaningful scene is here, when Amanda Waller shows up to tell Oliver he needs the darkness in himself sometimes and she was totally teaching him a lesson. And oh, does he want a job? Oliver declines so that he can fulfill a promise he made to Taiana, which suggests that next season’s flashbacks will take us to Russia. Oliver’s rousing speech earlier inspired the city council to make him interim mayor of the city, which is an interesting development. It remains to be seen how Oliver will balance being the Green Arrow with being the mayor next season. Of course, it could be that none of this even matters, because if you watched The Flash finale, you are aware that Barry just massively changed the timeline. I mean, the Butterfly Effect of that event should ripple across all of the Berlantiverse, shouldn’t it? Here’s hoping Barry’s idiocy hits the reset button on the Arrowverse, because it rather desperately needs a reboot, if this awful finale is anything to go by. Bad enough this show killed off Black Canary, but the season ends on a whimper like this? The finale has caused such an uproar on the internet that the Arrow sub-reddit changed its name to Daredevil in protest. Now that’s cold. Stay tuned for a bigger in-depth analysis of all of Season 4, and what we might come to expect for Season 5. Meanwhile, what did you think of the Arrow finale?